Light makes sure that photosynthesis takes place in a plant. Therefore, in most cases a grower wants to get as much light as possible in his greenhouse. This can be done by using assimilation and LED lighting, but a cheaper way is to make optimum use of sunlight. In this article, our shading agent specialist shares his tips for optimal use of sunlight. The simplest way to get more sunlight into the greenhouse is to make sure that the greenhouse is clean. In time, surface on the greenhouse becomes polluted and roots will grow into the gutters. This pollution blocks (large) part of the sunlight. By regularly cleaning your greenhouse, you could avoid this light loss. The easiest and safest way to clean your greenhouse is using a Top Cleaner. However, the inside of your greenhouse can also be polluted by rust, dust, algae and other types of pollution. With a glass cleaner you can remove this dirt. This can be done manually, but also via a Aquajet to clean the inside of your greenhouse. Another way to make more use of the sunlight is to apply a diffuse coating on top of your greenhouse. A diffuse coating creates diffuse light which is a light that is scattered. The light penetrates deeper into the crop, allowing the plant to absorb more CO2 and then processing it into more stable growth, production and quality. In spring and summer, growers want to protect their crops from excessive amounts of sunlight and high temperatures. For this purpose they use shading agents and / or the above-mentioned diffuse coatings. However, as soon it becomes fall, it is advisable to remove these shading agents and / or diffuse coatings as soon as possible from the greenhouse so that the sunlight can do its job again. Do not wait too long for this so you can take optimal advantage of all sun light available in fall and winter time. Do you have questions about the optimal use of sunlight in your greenhouse, or would you like a personal advice? 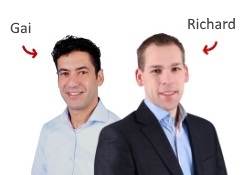 Please contact product specialist Richard Hagedoorn, or ask your question using the form below. 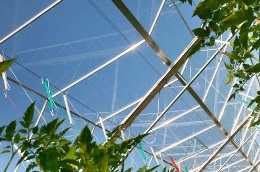 - How can the roof of your greenhouse be cleaned safely? - How do you use a glass cleaner in a greenhouse?